1. The lack of clear, concise, unambiguous, unqualified answers could very easily become the basis of conflict in the future, and any agreements built upon these letters would probably result in misunderstandings and unhappy administrative relationships. 2. The Sanctuary Review Committee rejected his arguments and conclusions on the heavenly sanctuary, the investi gative judgment, and the role of Ellen G. White in the church as not being sufficiently convincing to cause the church to change its distinctive beliefs in these areas, despite Dr. Ford's postscript to his first letter affirming otherwise. 3. Although Dr. Ford has conducted himself as a Christian gentleman during the past eight months, certain negative aspects have been evident. Dr. Ford has not accepted the judgment and advice of administration, the guiding committee, or the Sanctuary Review Committee in areas considered vital to the church. Further, he seems to have failed to sense his responsibility for the effect of his speaking and his widely distributed writings and recordings, which have caused divisive controversy within the church on several continents. 4. Although Dr. Ford has pledged himself to work for the unity of the church, he has repeatedly declined to disassociate himself openly and specifically from certain activities considered to be subversive to the well-being of the church. In light of these conclusions, PREXAD, in a spirit of deep regret, recommended to the Australasian Division that Dr. Ford be given the opportunity to withdraw voluntarily from the teaching and pastoral ministry of the Seventh-day Adventist Church, in which case his ministerial credentials would become in valid. In the event that he does not choose to do so, it was felt that, in order to be consistent with the findings and policies of the church, Dr. Ford's employing organization—the Australasian Division and Avondale College board—should relieve him of his responsibilities as a minister and teacher and withdraw his ministerial credentials. Prior to the meeting of PREXAD on September 2, Pastor Neal Wilson met with Dr. Ford for more than an hour on the morning of August 22. During this time Pastor Wilson outlined some of the critical areas involved in his theological positions and appealed to him to consider carefully the counsel he had received from a number of individuals regarding his beliefs that are at variance with the accepted teachings of the church. In response, Dr. Ford discussed some of his views and indicated that there was no change in his position on the two crucial areas under discussion. He reaffirmed his faith in the church and expressed his feeling that he had received very kind and fair treatment during the past few months. Dr. Ford also spoke of his new book on Revelation, indicating that when it is published it will be seen to differ in certain areas with present Seventh-day Adventist interpretations on the book of Revelation. On the afternoon of September 4, Pastor Wilson again met with Dr. Ford in order to convey to him PREXAD's counsel to the Australasian Division based on the reaction of that group to his replies to Pastor Parmenter. Also present at this meeting was Pastor Lowell Bock, General Conference vice-president. Point by point, the president went over with Dr. Ford the counsel being sent to Australasia regarding his situation. Dr. Ford commented that had he been in the place administration found itself, and from their point of view, he would probably have offered the same counsel that was being given. The discussion turned to the matter of "new light" and the counsel of the Lord that such light will not contradict or negate light already given. The idea was set forth that one must submit "new light" to brethren of experience and then yield to their judgment, for there is safety in a multitude of counselors. Pastor Wilson commented that Dr. Ford did not appear really to accept this philosophy, that he required evidence before changing an opinion, and has set up his own criteria of what is acceptable evidence criteria that exclude the writings of Ellen G. White as being doctrinally authoritative. Pastor Wilson reasoned with Dr. Ford regarding his unwillingness to take counsel or guidance from others—even scholars who in particular areas of expertise might be considered to have a clearer under standing than he does of certain theological matters. It was pointed out to him that when one persists in having his own way and is unwilling to yield to the judgment of responsible bodies, it be comes very difficult for that individual to continue as a spiritual leader in the church. As examples of this unwillingness to yield, Dr. Ford was reminded of the appeals made to him to modify certain matters during the preliminary study that was given to his document by the guiding committee. He had been told that his case for Antiochus Epiphanes in Daniel was weak and that it would be better to leave that point uncontested, yet he insisted on the importance of this item. His apotelesmatic principle was faulted as something that could not be sustained because it ultimately neutralized many scriptural prophecies; he was urged to see the difference between general and apocalyptic prophecies, but in these in stances, too, he seemed to have ignored the advice. The discussion turned to the matter of Ellen G. White and her role in doctrinal and theological matters. Her authority, in relation to Scripture, and the question of whether she could be considered a reliable, inspired commentary of Scripture was examined. In this area Dr. Ford set forth his viewpoint, and indicated that he cannot agree with what the church holds in this matter. Both Pastors Wilson and Bock pleaded with him to look again at the issues, but he indicated that to change his views without evidence would be to deny his conscience. He expressed a willingness to keep silent on these things, but said that it would be impossible for him to preach or support the commonly held Adventist positions without compromising his integrity. Pas tor Wilson told him that a minister can not be silent on two such distinctive matters of doctrine and still represent the Seventh-day Adventist Church. Dr. Ford then raised the question of others who may believe as he does on these points. Will they be asked to recant or to sign a document in order to retain their ministerial position? Pastors Wilson and Bock replied that the church has no desire whatsoever to humiliate an individual who has certain areas of doctrinal belief that trouble him and who is seeking honest answers from the church and who is willing to yield to the judgment of a multitude of counselors and brethren of experience. The church is not going to create some type of surveillance system, and, in their opinion, it never should. 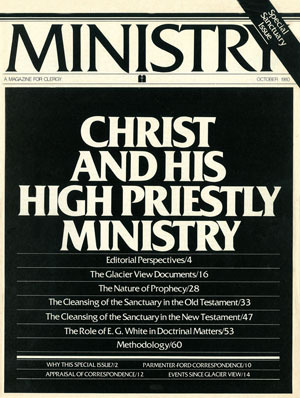 On the other hand, a minister who cannot conscientiously support significant doctrines of this church and who openly challenges the church, indicating that it is wrong in certain areas and always has been wrong, and who creates a divisive situation by drawing followers to himself and engaging in schismatic activities, should probably expect to be questioned to determine whether it is wise or possible for him to continue as a minister of the gospel in the Seventh-day Adventist Church. Dr. Ford seemed to accept this as a reason able position. In conclusion, Pastor Wilson made an earnest appeal to Dr. Ford to stay close to the Lord, and also to stay close to this church and its leaders. He reminded Dr. Ford that, almost without exception, others who have challenged the church in these very same areas have gone on to leave the church completely and often to lose all interest in spiritual things. Pastor Wilson expressed his conviction that in light of past history, if Dr. Ford came through this experience in a positive way, maintaining a strong allegiance to the church, it would be a unique exhibit of God's grace. He said that he was praying that such an exhibit would be the result in Dr. Ford's case. Pastor Bock offered a beautiful prayer of intercession in behalf of Dr. Ford and his wife and son. Then the men parted. the two crucial areas under discussion. ing the past few months. forth that one must submit "new light"
Pastor Wilson commented that Dr.
dence would be to deny his conscience. the Seventh-day Adventist Church. Dr.
church and its leaders. He reminded Dr.
result in Dr. Ford's case. his wife and son. Then the men parted.